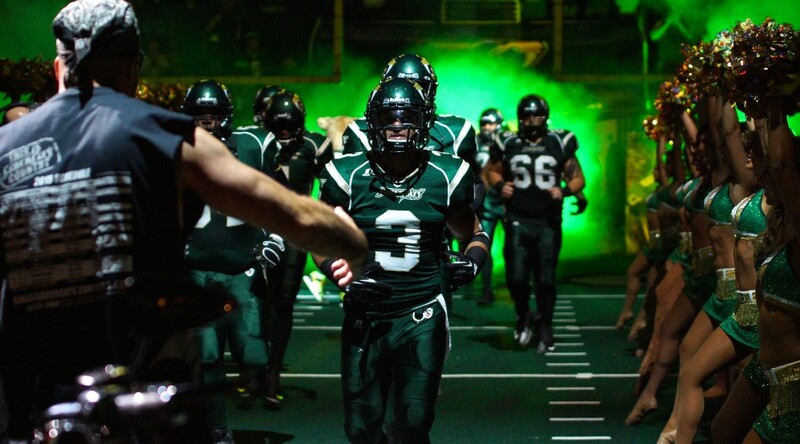 San Jose, California – The San Jose SaberCats (4-0) return home after a two-game road trip in Florida to host the Portland Thunder (2-2) at the SAP Center on Saturday, April 25th. The showdown will be the first of three Pacific Division matchups between San Jose and Portland and will be the first division game for the SaberCats this season. Thus far, the Thunder is 1-0 in the division after defeating Spokane 47-43 in week three. Unique to the conception that offense rules the Arena Football League, this battle will be won on the defensive side of the ball. The two teams are ranked in the top four of the Arena Football League in scoring defense, with San Jose the top-ranked unit. Coming off a 68-48 victory over the Jacksonville Sharks last week, the SaberCats are clicking on both sides of the ball. In his best performance this season, quarterback Erik Meyer completed 19-of-30 passes for eight touchdowns against the Sharks. Although he has been able to grasp and orchestrate the offense, Meyer’s efficiency will be tested against a very capable Portland secondary. The young defensive back duo of Okechu Okoroha and Osagie Odiase were off to a good start before running into Nick Davila and the rest of the defending three-time ArenaBowl Champion Arizona Rattlers. After giving up an average of 44.7 points per game against its first three opponents, the Thunder were rocked last week, surrendering 65 points to Arizona, with Davila throwing for 319 yards and nine touchdowns. As the Rattlers best receivers, Rod Windsor and Kerry Reed had a combined 24 receptions for 262 yards and nine touchdown receptions (six for Windsor). The road doesn’t get any easier for Portland, who will have a group of athletic and talented receivers they will hope to contain in San Jose. In his second game as a SaberCats, wide receiver D.J. Stephens had three receptions for 84 yards and a 39-yard touchdown reception against the Sharks. Stephens has scored three total touchdowns in his first two games in San Jose and is averaging 82.0 yards receiving per game. His contributions to the offense have allowed San Jose to possess the deepest receiver core in the league. Reggie Gray, the team’s leading receiver also made a tremendous impact on special teams last week against the Sharks, returning a kickoff 58 yards for a touchdown. Gray leads the team with 31 receptions for 301 yards and six touchdowns, but his ability to impact the game on special teams and provide favorable field position for San Jose is just as paramount. Jack linebacker David Hyland’s productivity has been the biggest surprise to start the season for San Jose. Currently, he is second on team in tackles, leads the team with three fumble recoveries and has a pair of interceptions. Roaming in the middle of the defense, Hyland’s instincts and play making ability has propelled the SaberCats to the top of the ranks defensively in the league. One of the best jack linebackers in the AFL, Portland’s Bryce Peila has picked up where he left off last season. Peila, who was named First-Team All-Arena last season, has already been named AFL Defensive Player of the Week in week three and has 15 tackles with two interceptions and a fumble recovery. To go along with Peila’s success is defensive lineman Marquis Jackson. Jackson leads the AFL with four sacks and also leads the Thunder with seven pass breakups. San Jose has had some issues containing elite pass rushers and the focus for its offensive line will be on Jackson to keep Meyer upright. Enough credit cannot go to the San Jose’s defensive line, which is another major reason to fear the teeth of the SaberCats stout defense. As a unit, the four man rotation has totaled 13 sacks to lead the AFL. Luis Vasquez, Jason Stewart, Donte Paige-Moss and Rodney Fritz have been a menace for opposing offensive lines and their ability to get pressure on the quarterback has allowed the secondary to capitalize on turnovers. Working as a cohesive unit, the SaberCats defense will look to remain the best in the league under the guidance of defensive coordinator Cedric Walker. For the Thunder to have a chance offensively, wide receiver Jamar Howard will have to continue the streak he has been on. Last week against Arizona, he had nine receptions 138 yards and four touchdowns as the Thunder’s leading man. On the season, Howard has 585 receiving yards and his 13 touchdown receptions lead the AFL. Lining up on the opposite side of Howard, receiver V’Keon Lacey has been able to exploit when opposing secondary’s focus on Howard. Last week he hauled in eight receptions for 108 yards and two touchdowns to bring his season totals to 27 receptions for 307 yards and five touchdowns. Lacey will have to find his way against the physical SaberCats trio in the secondary of Clevan Thomas, Eric Crocker and Ken Fontenette. Quarterback Kyle Rowley has had some high and low spots this season. In his sixth season in the AFL, Rowley is ranked in the top five in passing yards (1,034) but also has a league-high five interceptions in four games. With San Jose’s defense leading the AFL with six interceptions and two returned for a touchdown, Rowley will have to be at his best to give Portland a chance to knockoff the undefeated SaberCats. These two Pacific Division foes boast two of the top head coaches as well. SaberCats Head Coach Darren Arbet is ranked second all-time in regular season wins (156) While Thunder Head Coach Mike Hohensee ranks third (155). The SaberCats are 3-0 in games against the Thunder, with San Jose winning 64-27 at home in the last meeting on May 17th of last season.